KIEV, April 9. /TASS/. 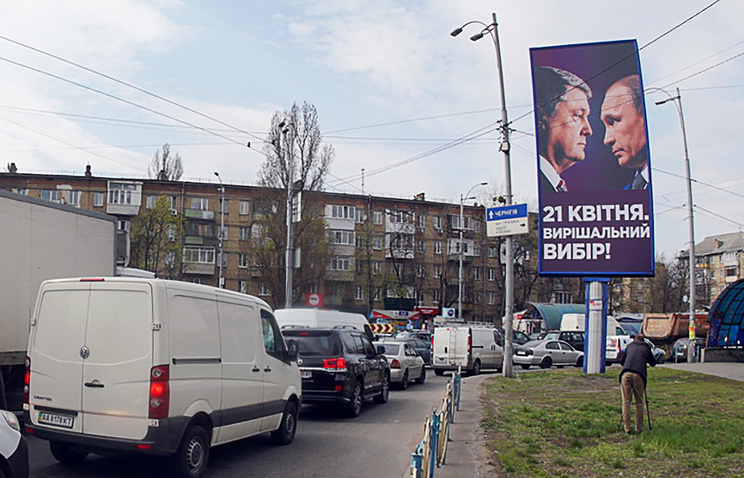 Incumbent Ukrainian President Pyotr Poroshenko has ordered more than 2,000 billboards showing him together with Russian President Vladimir Putin, weaponizing the Russian leader for his political gains. Each of them has the inscription under the photos, reading "April 21. A Crucial Choice". It is written on the billboards that they were ordered by "candidate for the Ukrainian presidency Poroshenko P.A." to the amount of 2,104 copies. Meanwhile, under the legislation, using the images of people without their written consent is banned in Ukraine, along with using people who are not nationals of the country in the election campaign. The leader of the Civil Position Party, Anatoly Gritsenko, was the first to lash out at these election billboards. The former candidate for the Ukrainian presidency said the Poroshenko headquarters was splitting the country into two by this advertising. "This is dangerous for the country. The advertising and newspapers that are circulated by Poroshenko’s headquarters, are intentionally splitting the country into two," said Gritsenko, who had earlier dropped out of the presidential race. Meanwhile, the sitting president must be the guarantor "of integrity and unity of Ukraine," he wrote on his Facebook account. President Poroshenko had built his election campaign around matching up himself against the Russian president. He said the Russian leader was his main opponent at the election, and those who were against him therefore support Putin. In the run-up to the election’s second round, Poroshenko is disseminating leaflets and plastering images on billboards throughout the streets nationwide showing the two leaders face-to-face with a couple of slogans reading: "April 21. A Crucial Choice" or "April 21. The Choice Is Yours!" On Sunday, Ukraine’s Central Election Commission announced the official results of the first round of the presidential election in the country. The candidate from the Servant of the People Party Vladimir Zelensky received 30.24% of votes, while incumbent Ukrainian President Pyotr Poroshenko came in second with 15.95%. The runoff race has been set for April 21.